Offshore oil and gas activities can result in the discharge of large amounts of drilling muds. While these materials have generally been regarded as non-toxic to marine organisms, recent studies have demonstrated negative impacts to suspension feeding organisms. We exposed the arctic-boreal sponge Geodia barretti to the primary particulate components of two water-based drilling muds; barite and bentonite. Sponges were exposed to barite, bentonite and a natural reference sediment at a range of total suspended solid concentrations (TSS = 0, 10, 50 or 100 mg/L) for 12 h after which we measured a suite of biomarker responses (lysosomal membrane stability, lipid peroxidation and glutathione). In addition, we compared biomarker responses, organic energy content and metal accumulation in sponges, which had been continuously or intermittently exposed to suspended barite and natural sediment for 14 d at relevant concentrations (10 and 30 mg TSS/L). Lysosomal membrane stability was reduced in the sponges exposed to barite at 50 and 100 mg TSS/L after just 12 h and at 30 mg TSS/L for both continuous and intermittent exposures over 14 d. Evidence of compromised cellular viability was accompanied by barite analysis revealing concentrations of Cu and Pb well above reference sediments and Norwegian sediment quality guidelines. 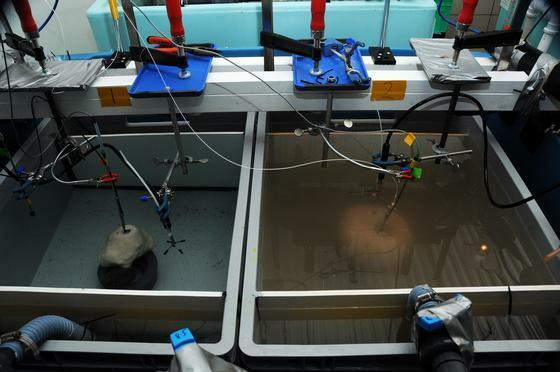 Metal bioaccumulation in sponge tissues was low and the total organic energy content (determined by the elemental composition of organic tissue) was not affected. Intermittent exposures to barite resulted in less toxicity than continuous exposure to barite. Short term exposures to bentonite did not alter any biomarker responses. This is the first time that these biomarkers have been used to indicate contaminant exposure in an arctic-boreal sponge. Our results illustrate the potential toxicity of barite and the importance of assessments that reflect the ways in which these contaminants are delivered under environmentally realistic conditions.